Three bars AB, AC, and AD are pinned together as shown in Fig. P-257. Initially, the assembly is stress free. Horizontal movement of the joint at A is prevented by a short horizontal strut AE. Calculate the stress in each bar and the force in the strut AE when the assembly is used to support the load W = 10 kips. 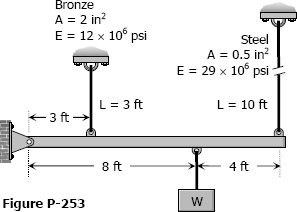 For each steel bar, A = 0.3 in.2 and E = 29 × 106 psi. For the aluminum bar, A = 0.6 in.2 and E = 10 × 106 psi. 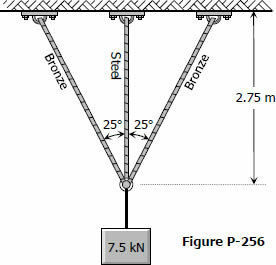 Three rods, each of area 250 mm2, jointly support a 7.5 kN load, as shown in Fig. P-256. 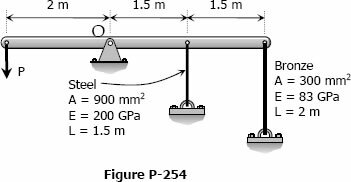 Assuming that there was no slack or stress in the rods before the load was applied, find the stress in each rod. Use Est = 200 GPa and Ebr = 83 GPa. Shown in Fig. 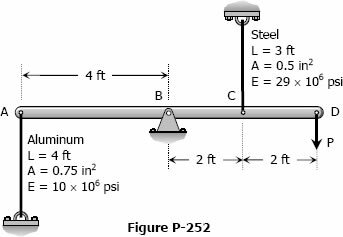 P-255 is a section through a balcony. The total uniform load of 600 kN is supported by three rods of the same area and material. Compute the load in each rod. Assume the floor to be rigid, but note that it does not necessarily remain horizontal. As shown in Fig. 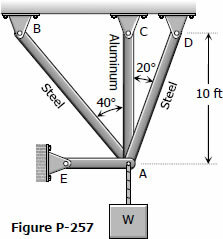 P-253, a rigid beam with negligible weight is pinned at one end and attached to two vertical rods. 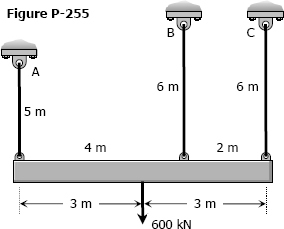 The beam was initially horizontal before the load W = 50 kips was applied. Find the vertical movement of W.
There is a radial clearance of 0.05 mm when a steel tube is placed over an aluminum tube. The inside diameter of the aluminum tube is 120 mm, and the wall thickness of each tube is 2.5 mm. Compute the contact pressure and tangential stress in each tube when the aluminum tube is subjected to an internal pressure of 5.0 MPa. 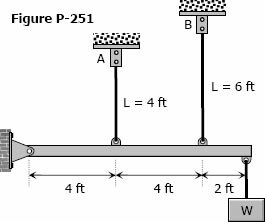 Solve Problem 247 if the right wall yields 0.80 mm.